Especially the rulers can help you stop using the Mac screenshot pixel feedback to measure distance in your UI. Simulator tools give you access to more functionalities within the iOS simulator and make it often easier to access features like recording a video with xcrun. Some of the tools are paid while others are open sourced and free. Although this app seems outdated, it does still work on Mojave. 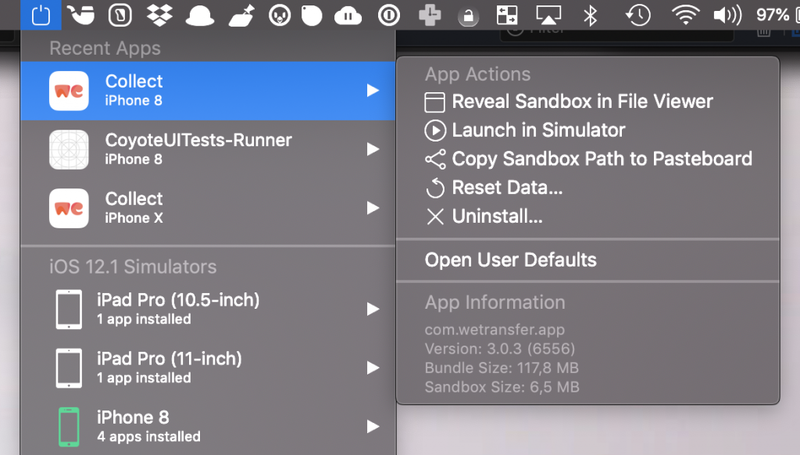 Feature highlights include quick access to the user defaults and the App Groups Container, but nothing really big to make it an outstanding added value. With open-source alternatives you might want to save yourself the money. The SimPholders application window opened. Easily access apps on your iOS Simulators. Explore folders, edit Core Data content and much more! simMagnifier comes with a bit more features compared to SimPholders, but is a bit more expensive as well. This might be the tool for you if you’re using Core Data as it comes with a Core Data browser with even the possibility to change data. Access to common folders and the user defaults are included as well. simMagnifier window opened with Core Data access. Although xScope is the most expensive one from this simulator tools list, it comes with the most features as well. It could easily be listed with the UI Tools blog post from a few weeks ago. 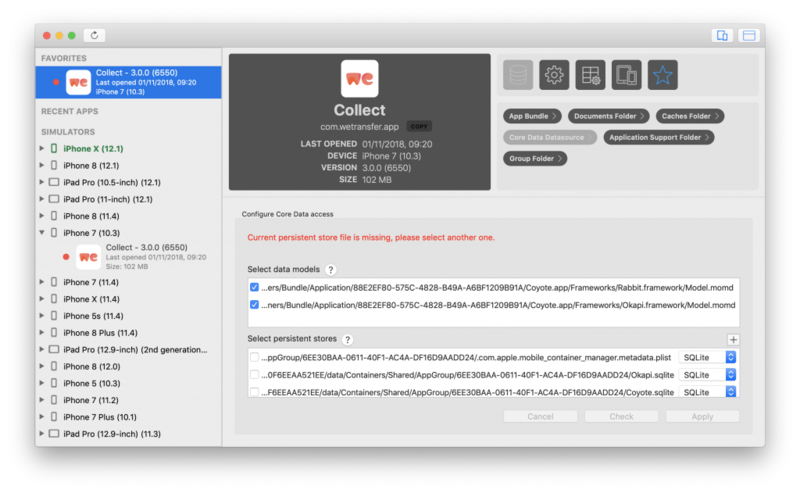 It’s not a tool to access Core Data or User Defaults and it does not provide quick access to common folders, but it does add a lot of tools to verify your UI. These tools include rulers, guides and a loupe which follows your mouse for a more detailed view of a piece of UI. Especially the rulers can help you stop using the Mac screenshot pixel feedback to measure distance in your UI. 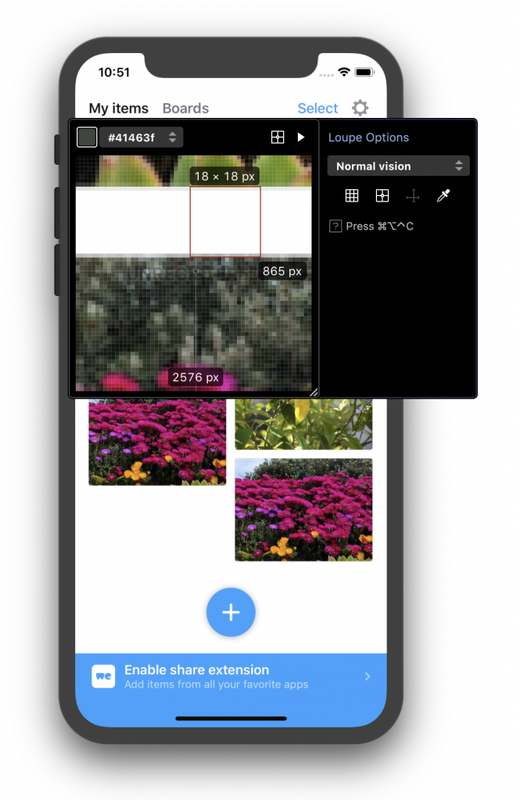 The Loupe enabled in xScope to measure distance in the UI. Apart from these paid tools, some open source alternatives are available to use as well and worth to explore.